Everything is coming up roses this week (or at least flowery) as it’s the week of the Chelsea Flower Show. I visited the Kensington Hotel last night to sample the special cocktail they’ve created to celebrate all those stunning floral displays down the road. 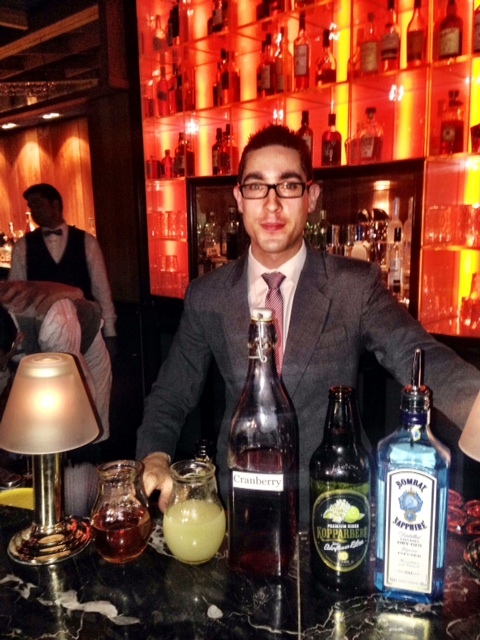 Their mixologist Alessandro Pizzoli has concocted the Lily of the Valley, a gin based cocktail served tall over ice. While we where there, Alessandro walked us through all the ingredients used including the homemade lavender sugar they use to give the drink an extra lift. The cocktail is served with seasonal edible flowers which I, of course, scoffed down along with the drink. I love eating edible flowers and the tastes are always surprising! The Kensington is also offering a floral themed menu to go along with Lily of the Valley signature cocktail. In keeping with the theme of the show, the menu features unique botanical dishes such as chanterelles with green dandelion and puntarella, spring chicken with elderflower, and bitter chocolate and rosewater delice. They also include wild fennel flowers and hand-foraged pennywort in other dishes. The Lily of the Valley costs £14.50 while the floral menu is priced at £24 for two courses and £30 for three. Both are available to enjoy from 15th until 31st May. For more information, visit the hotel website here.